When hundreds protested in Los Angeles in 2014 over a grand jury&apos;s decision in Ferguson, Mo. to not indict a white police officer over the shooting death of unarmed black teen Michael Brown, activists then argued that police violated the demonstrators&apos; constitutional rights. Now, over a year later, those protesters have filed a class-action lawsuit against the city for just that. The lawsuit was filed this week on behalf of the individuals by National Lawyers Guild Los Angeles, according to the L.A. Times. It also named LAPD Chief Charlie Beck and other LAPD officials, arguing that the LAPD did not properly give dispersal warnings to the crowds. The suit claims that the city violated their 1st, 4th and 14th Amendment rights. After the Nov. 24, 2014 grand jury decision, dozens of protests broke out across the country. Over the next few days, protesters in L.A. for the most part marched peacefully throughout the city, from Beverly Hills to downtown and South L.A. While demonstrators marched and some blocked traffic and freeways, there wasn&apos;t looting or fires like the epicenter of the protests in Ferguson. Over 323 protesters were arrested or detained during that time in Los Angeles, with many sitting in jail cells until they were released on Thanksgiving. 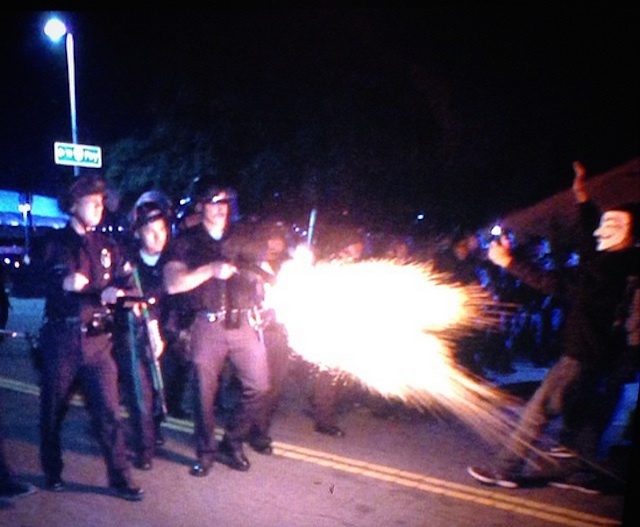 LAPD at the time said they arrested some for failure to disperse and disorderly conduct. The suit claims protesters were told they were detained for blocking traffic. The suit says that although LAPD officers gave dispersal orders at one of the protest spots, demonstrators at another location didn&apos;t hear the warnings. It also says law enforcement "detained, interrogated" protesters and that they were "forced to give up personal information." Last November, Erin Darling, co-president of the National Lawyers Guild in Los Angeles, told the Times: "The LAPD used constitutionally dubious crowd-control tactics, in particular using a &apos;failure to disperse&apos; in one time, in one place and with one group of protesters at another group, at another time and another place." LAPD spokesman, Capt. Andrew Neiman, did not provide comment about the suit to the Times, saying it was because it&apos;s an ongoing litigation. At the time of the arrests, however, police argued that they stood by their department&apos;s handling of the protesters. "We&apos;re going to let the courts determine if our pre-dispersal orders and arrests were legal," LAPD Cmdr. Andy Smith told the Times in 2014.